Day in and day out, the T880 is a dependable, versatile vehicle capable of performing the toughest jobs productively and efficiently. Kenworth Driver Performance Assistant includes a built-in virtual driver’s coach with real-time coaching based on coasting and braking to improve fuel economy and brake life. Kenworth Adaptive Cruise Control A radar-based safety system designed to reduce the likelihood of a collision. Using always-on Collision Mitigation Technology, Adaptive Cruise Control works in conjunction with standard cruise control to monitor the following distance of the vehicle ahead and automatically keep a safe and constant following distance. 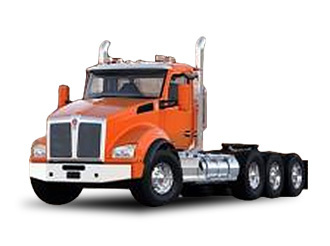 The T880 is available with the industry leading PACCAR MX-11 Engine.